Ethan McSweeny's productions for the Shakespeare Theatre Company have been marked by a devotion to spectacle (from the sand-covered island of The Tempest to the ramshackle backstage glamor of Midsummer Night's Dream) and sharply focused insights into familiar characters that populate some of Shakespeare's best-known stories. With the Harman's stage transformed into an airport waiting lounge, with a figurative cascade of travelers and a literal one of suitcases, the penchant for spectacle is certainly still there, and is no bad thing. It's a beautiful choice for Twelfth Night, a play that depends on strange and unexpected encounters between characters who never should have been brought together- not only the sudden arrival of Viola and Sebastian to Illyria, but even the passing ships of Olivia, Orsino, and poor Sir Andrew, who might well have met in passing but who continue to circle round each other in eternal exasperation until the lucky chaos of the play's events take flight. The airport terminal is a perfect place to throw disparate characters together and bind them together for the length of a journey, and one that seems well suited to the play, especially considering the anarchic currents that always linger just under the surface in airports- when delays stretch out and cancellations start to mount, the veneer of orderliness feels very thin. Watching the actors move benches around the space to suit their needs and throw pillows over unrelenting plastic and metal feels suited to the increasingly topsy-turvy engine of Twelfth Night. And yet, if you'll forgive the unintended pun, McSweeny's Twelfth Night never quite took off for me. The beauty of this play has for me always lived in its vision of second chances after terrible mistakes and the chances that come when it seems as though we've already lost everything else worth having. (Production-centric spoiler alerts abound in the rest of this paragraph only) McSweeny's production reframes all the events of the text as though they are the (seemingly) dying fantasy of Viola in the haze of an airplane crash, reimagining all of her fellow passengers in an Oz-like repurposing of the familiar. If suddenly these characters are only the brain-addled fantasies of one character, the stakes fall out of the bottom of Shakespeare's play and are replaced with a straightforward tragedy of characters we never truly met. Why should I care when Malvolio is tormented if he never existed? Why care that Olivia finally leaves behind her mourning for joy, or that Viola's lost brother is found? Even within the standard bounds of fiction, this places us at a level too distant for my taste. "Be sad because these characters you don't actually know are dead" is nowhere near the tragedy of Viola's pain, and loses the double sweetness that tempers both that pain and its redemption in joy that Shakespeare gives us. This production certainly has charm, and its charms stem from intelligent choices from the designers and ensemble that McSweeny has gathered. Jennifer Moeller's smart costumes, teeming with embellishments, bedeck the world of the play with color and an aesthetic that proclaims we are not entirely in our own world. Lee Savage's set transforms the Harman's familiar contours into a surprisingly adaptable lounge, lit by Scott Zielinski and complimented by Patrick W. Lord's projections and video. As Feste, Heath Saunders brings Lindsay Jones' settings of Shakespeare's songs to glorious life, and Hannah Yelland's Olivia and Antoinette Robinson's Viola are standouts among the ensemble of actors. The humor of the play is present in spades, carried with deft hands by Jim Lichtscheild's Sir Andrew. There's charm, there's beauty, there are scooters, but ultimately, McSweeny's production left me cold. I never felt an emotional connection with these characters, and perhaps McSweeny's invented frame is directly behind that distance, undercutting the heft of Shakespeare's masterful comedy. 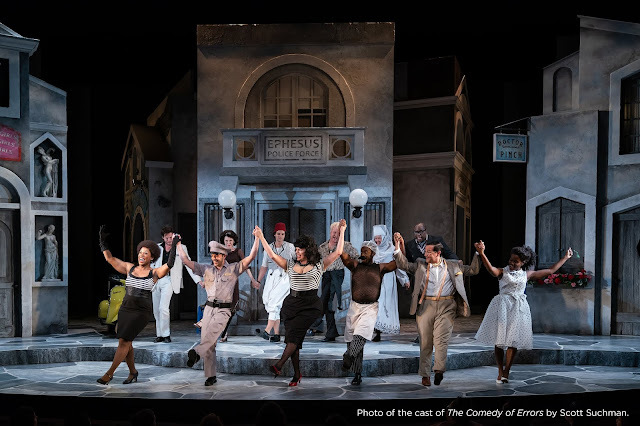 Twelfth Night is a play that already understands the way that life entwines grief and joy, despair and hope, laughter and painful self reckoning; superimposing a narrower, one-note lens over the play feels like the breadth of Shakespeare's vision has been restricted, rather than set free.